An amazing experience is made even more spectacular when it’s shared with others. And one of your good friends has been kind enough to share their amazing journey with you and also give you a little step forward towards your experience of South America. 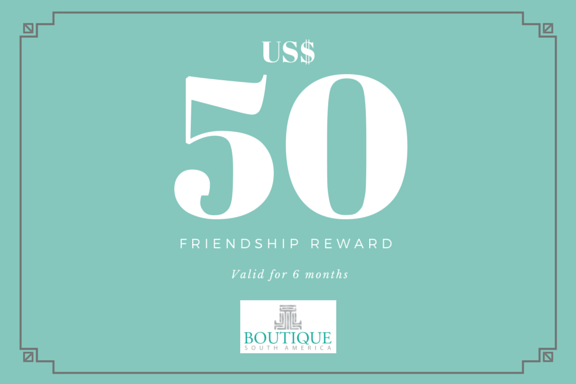 With our Friendship Rewards program, you will be entitled to US$50 off any of the experiences published on Boutique South America’s website. That’s right, ANY of our travel experiences. Your US$50 Experience Credit will be valid for 6 months from the date you claim it, giving you plenty of time to figure out when and when to travel to South America. Only one coupon valid per booking. So what are you waiting for? Claim your Experience Credit today!